Days after the US and Russia decided to leave the Intermediate-Range Nuclear Forces (INF) Treaty, the UK-based tabloid, Daily Express, published an article on the "safest" place to escape radiation in the event of a nuclear war. It turns out that the media outlet has a whole section dedicated to a hypothetical World War III. The section's description suggests that it includes World War III predictions and all the news on the next possible worldwide conflict, with basically every third headline implying that it would somehow involve Russia, Iran, China, and North Korea. 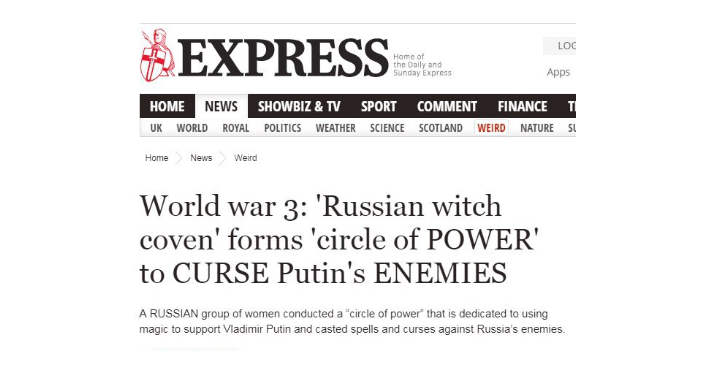 Screengrab from The Daily Express: "The TERRIFYING countries most likely to spark World War 3 - shock US spy warning"
Screengrab of the Daily Express: "World War Three: The 'safest' place to escape radiation amid a nuclear attack revealed"
Screengrab from the Daily Express: "World War 3: 'Russian witch coven' forms 'circle of POWER' to CURSE Putin's ENEMIES"
Screengrab of the Daily Express: "Putin pulls Russia out of US nuclear treaty putting world at risk of World War 3"
Screengrab from the Daily Express: "Putin delivers CHILLING World War 3 warning over Russian weapons"
Since 4 February, the tabloid has published 33 articles in the section on such topics as an arms race, the political crisis in Venezuela, Russia's pullout from the INF in response to Washington's withdrawal, the nuclear threat from North Korea and Iran — all these developments would imminently lead to an apocalyptic scenario. 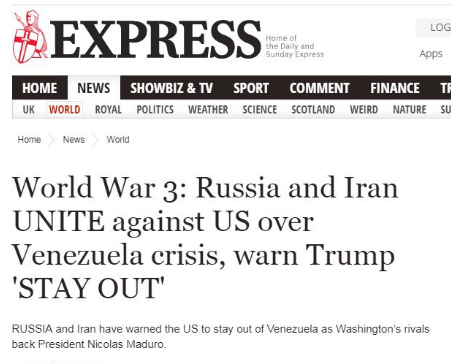 Screengrab from The Daily Express: "World War 3: Russia and Iran UNITE against US over Venezuela crisis, warn Trump 'STAY OUT'"
As surreal as it may seem, Daily Express's "World War III" warning section is not one-of-a-kind: another British tabloid, the Daily Star, also has one. Its news updates are, however, less frequent. Here is an example of how the UK media publishes noxious excrement for the purpose of keeping the populous dumbed down to the extent that a potato is better informed about current affairs. Hey I think I can work for Daily Express! Chance of RAIN tomorrow WORLD WAR 3 INCOMING Nasa leaks HUGE ASTEROID heading towards EARTH on CHRISTMAS DAY! UK newspapers are writing a lot about China now. 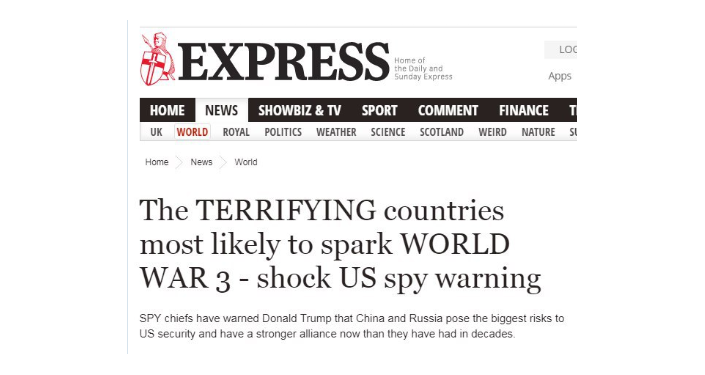 All news on Express and Daily Star start with "World War 3" then something about Russia or China. Last few days it was China's EMP bomb and rail gun.